We are exposed to toxins every day of our lives. These toxins can accumulate in our bodies and affect our health. Cleaning products are notorious for toxins — just the smell of most of them reveals this fact! Green cleaning uses cleaning products that are friendly to the environment and to us as humans, which will improve our health and the environment. Integrity First Professional Services in Charlotte, NC, uses environmentally-friendly cleaning products in all of our cleaning services. Contact us today! Microfiber in essence is split fibers. These split fibers create a larger surface area to pick up and trap dirt without using other additives such as cleaning agents. Traditional clothes have fibers that are very close together, resulting in the need to scrub more and use more cleaning products to achieve the same results. WHY CHOOSE MICROFIBER CLEANING CLOTHS? Microfiber is revolutionizing the cleaning service industry. Microfibers eliminate the need for a lot of other cleaning agents. Water can achieve the same results as a harsh chemical cleaner and is cheaper. Many people are switching to microfiber cleaning cloths and it’s eco-friendly cleaning ability. Without having to breath in the list of chemicals on the back of commercial cleaners, your house and family will benefit. Microfiber cleaning cloths do well in the laundry and reduce cleaning time as well. WHERE CAN I USE MICROFIBER CLEANING CLOTHS? In the bathroom. Microfiber cleaning cloths are great for cleaning all surfaces in the bathroom. Removing hard water residue, scrubbing toilets and sinks, and using microfiber mops on the floor makes the often-dreaded job of cleaning the bathroom a breeze! In the kitchen. Microfiber cleaning cloths are great for the everyday spills that occur in the kitchen. Countertops, cabinets, and appliance surfaces only require a bit of water and the cloth to keep everything shiny and new. Microfiber cleaning cloths pick up a lot of the crumbs that used to take you twice as long to clean up. On the floors. A microfiber cleaning mop makes this task simple and easy. Add your favorite shining product to your mop bucket to make your floors shine. In the living rooms. The living spaces of our homes can be cluttered with life: toy trains, dolls, legos, and puzzle pieces are just some of the many hazards we face in our living areas. Microfiber cleaning cloths are versatile enough to clean around these precious items in your home. Dusting. Dust clings easily to microfiber cleaning cloths, ensuring you don’t breathe it in. A simple rinse will be enough to clean afterwards. Integrity First Professional Services strives to make your commercial cleaning or residential cleaning as eco-friendly as possible. 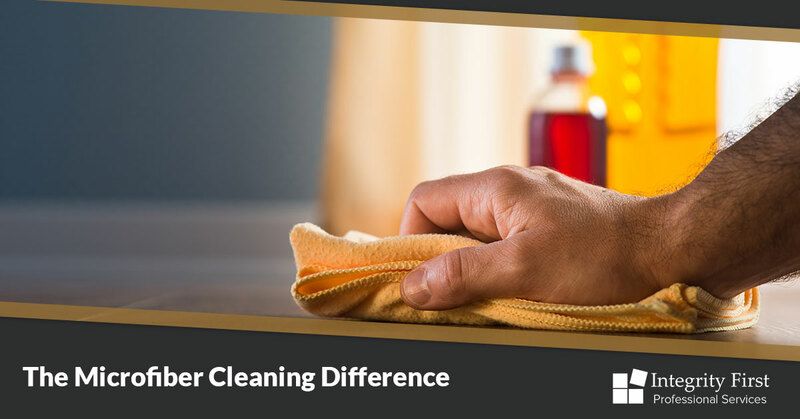 We value the health of those whom homes and businesses we enter and do everything we can to minimize the amount of cleaning products we use while still achieving top-rated cleaning results. Integrity First Professional Services serves the greater Charlotte or Greensboro areas in North Carolina. We take pride in our work and our services and always ask for feedback on how we’re doing. Customer satisfaction is key, and we’re challenged every day to exceed your expectations. Contact us today!